BariSelect® Low airloss mattress has two extra inches of depth and a 680 lb weight capacity. It offers more comfort to patients, is less expensive than other fully-integrates systems, and is easier for healthcare workers to operate. Air escapes from tiny air openings, distributed equally across the top mattress surface, and circulates under a vapor-permeable cover, to wick moisture away from the patient. BariSelect® Low airloss mattress has two extra inches of depth and a 680 lb weight capacity. 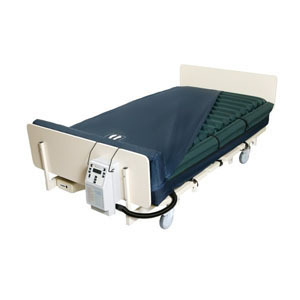 It offers more comfort to patients, is less expensive than other fully-integrates systems. Air escapes from tiny air opening. Distributed equally across the top mattress surface, and circulates under a vapor-permeable cover, to wick moisture away from the patient.